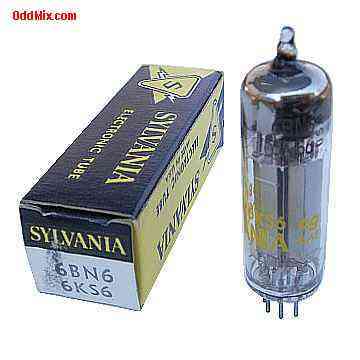 Sylvania This is a genuine vintage Sylvania 6BN6/6KS6 Beam Power Type electronic tube in it's original box. This tube was developed for combined limiter, discriminator audio-voltage amplifier in early intercarrier television and FM receivers. A beam tube with a heater-cathode and three grids can be used for many other special purpose circuits like oscillators and RF amplifiers. Excellent for replacement, antique radio, instrument, TV television restoration projects, experimentation, circuit research or to set up a private vacuum tube museum. It is NOS tube - New Old Stock, unused, boxed, excellent condition.